UCI dismantles team bikes after Milan-San Remo: was it looking for motors? 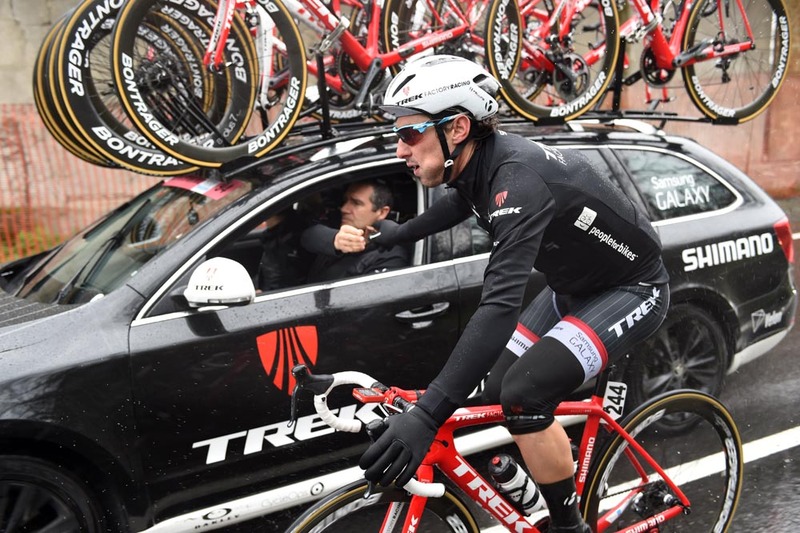 Cycling’s governing body moved in as fast as John Degenkolb’s winning sprint yesterday in Milan-San Remo to inspect the bicycles from several teams. The UCI tagged, controlled and released 37 bicycles – including the top three finishers and all those from teams Etixx-QuickStep and Trek Factory Racing – without any suspicious findings or explanation of what they were looking for. Before the finish in the Italian seaside city, the UCI announced via race radio that it would carry out controls. As the riders came to a stop on the famous Via Roma in the centre of the city, inspectors met selected ones and put a plastic bracelet around the bikes’ top tubes. They made sure that those bikes made it to a closed tent next to the parked team buses for inspection. They rolled away 11 bikes from Trek, including Fabian Cancellara‘s and some spare bikes. As Mark Cavendish showered and washed away the day, they took his and his Etixx team-mates Specialized bikes away. Also in the catch were machines from the top three riders – John Degenkolb (Giant), Alexander Kristoff (Katusha) and Michael Matthews (Orica-GreenEdge) – and 12 others. Tinkoff-Saxo Bank’s Specialized bicycles were reportedly among the 37, but Cycling Weekly has yet to confirm this with the team. The sudden and sweeping checks appeared to catch the teams and their mechanics off-guard, or perhaps they were not expecting it after the 300-kilometre race from Milan to San Remo. “They’ve taken plenty of bikes in the past, sometimes it’s in the TT [time trial] where it’s not that obviously when our riders are going there one by one,” said Rolf Aldag, Etixx’s sport and development manager. Various team mechanics emerged from the white tent with their hands in the air as if they had left an operating room. Instead of blood, their hands were black from the bike’s grease. Cycling Weekly was asked to stay out of the tent, where inside, seat posts and cranks were removed. The UCI confirmed yesterday that it has a right to carry out surprise checks like the one in San Remo and added that more would come. It would not say what its inspectors were trying to discover. It already acted in the final two stages of Paris-Nice, but it was a ‘lite’ version: taking two bikes each from six teams, according to Italy’s La Gazzetta dello Sport newspaper. Aldag said that the inspectors did not explain to him what they were checking. One idea is that they are looking for motors. In the 227-page Cycling Independent Reform Commission (CIRC) report released in mid-March, just in time for the Paris-Nice and Tirreno-Adriatico stage races, one paragraph was dedicated to the topic. “The Commission was told of varying efforts to cheat the technical rules, including using motors in frames. This particular issue was taken seriously, especially by top riders, and was not dismissed as being isolated,” read the report. The topic already came up twice before: once when Cancellara dominated the Tour of Flanders and Paris-Roubaix in 2010, and when Ryder Hesjedal crashed in the 2014 Vuelta a España. Both times, the incidents came to nothing.